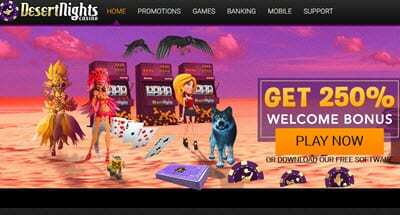 Desert Nights Casino no deposit bonus codes 2019 - Get $10 Free! Desert Night casino is a US-based casino providing world class casino experience to millions of punters everyday all year round. The casino, owned and operated by the famous Deckmedia N.V. Group, has a solid reputation for being a front runner in providing high quality gaming software. The group also operates numerous other casinos including Sloto’Cash, Spartan Slots and Miami Club. 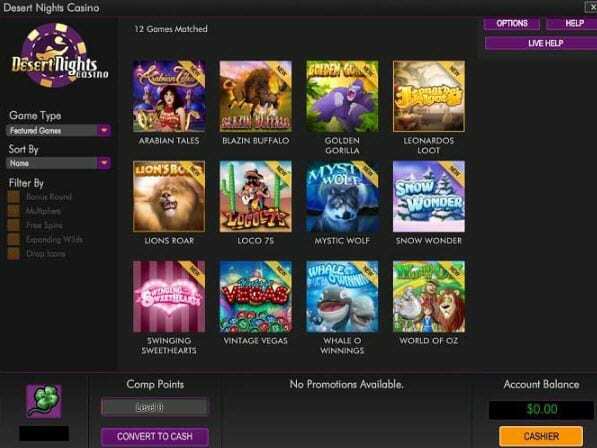 At its launch, Desert Nights casino operated on the Rival software, but it had to be launched again in 2012 with the RTG software, although Rival was still running for the old users. Again, in 2014, the Deckmedia made a bold move to rebrand the RTG version of the casino to Uptown Aces, meaning that Desert Nights operated on the initial Rival software, just like in the days of old. Despite the back and forth shifts in the casinos software, one thing though has been on a staggering increase; the quality range of games that is provided here. Play at Desert Nights Casino Now ! As mentioned earlier on, the casino currently operates on the Rival software. To get the most out Desert Night, it is highly recommended that you download the software since some of the games provided at the casino do not have an instant-play version. The installation and registration process at Desert Nights is so simple such that you will be done even before you know it. The site boasts of a series of video slots, pokers, table games and specialty games. Some of the video slots titles include Scary Rich, which has is characteristic of huge bonus rewards and Hole in Won that has a gold theme which makes it look glamorous and inviting to play. The Spartan Warrior is yet another game that can award punters with as much as 100 free spins which carry a 3x multiplier if it happens that you are the luckiest of them. There are also exclusive i-Slots, that comprise of progressive storylines with which unfolding as you plany. Progressive jackpot enthusiasts are also covered here with some promising 6-figure titles on offer. Some of these include Major Moolah, Strike Gold, One Million Reels BC and Money Magic. Desert Nights has an advantage over its other sister casinos in that it pays punters all progressive jackpot wins in one lump sum amount. This arrangement is way better as opposed to other plans where punters have to agree to a multi-year monthly payments. Some of the table games titles at Desert Nights include Three Card, Poker, Craps, Roulette and Blackjack amongst others. The limits in table games are low. Banking is a very important aspect of an online casino and Desert Night seems to perfectly understand this fact. The casino has an assortment of banking options that customers can explore for the deposits and withdrawals. Although it has limited payment options available, just like any other American-based casino, those which it avails are functional and fully accessible. The banking details accepted here include debit and credit cards as well as e-wallets. Punters can use Neteller, Skrill, EcoCard and Checks. The best thing about the casino is that it handles its payments expediently. All deposits reflect immediately while it takes just 2-3 business days to process withdrawal requests. However, for US-based players that request for payment via a check, it can take a maximum of one week before getting the check delivered to them. Compared to their rivals, their payments are among the best in the industry. Punters are only allowed to make weekly withdrawals amount to $2000 exclusive of the progressive jackpot winnings. Desert casino has a dedicated customer service team. There are three methods through which the team can be contacted. These are email, live chat and phone call. The team is very knowledgeable and it is as though they have the information that you are looking for right at their fingertips. It is as though they know the question that you are going to ask as they have the answer at the ready. Better still, the team is available round the clock, which means that your issues will be attended to regardless of the difference in the time zones. You also do not wait for excessively long periods before being attended to as they are never too busy to come to your rescue. Their live chats are also very interactive and responsive as they use human agents as opposed to some automated responses that never give any substantial help. Desert Nights casino is a fascinating casino that is dedicated to high-end gaming. The casino has a diversified selection of games some of which carry very attractive perks and promotions. The casino also boasts of expedient payouts that ensure customers have access to their money in as little a time as possible. Register today and get started on an unending gambling experience.